10-year-old Lariah Leon chooses to paint her sunflower yellow based on her perspective of the music being played in the background this morning during an “Exploring Color, Mood and Music” workshop at the Artesia Public Library. 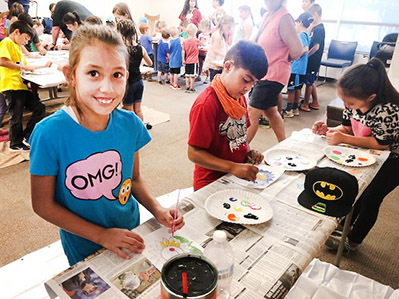 The workshop was facilitated by the Ocotillo Performing Arts Center to allow the more than 95 children in attendance the opportunity to explore the relationship between color and mood, and color and sound by giving them the materials to make their own connections without the pressure of representational drawing. After listening to samples of music, the children picked colors for their paintings based on their mood.